Geek Lit Etc. 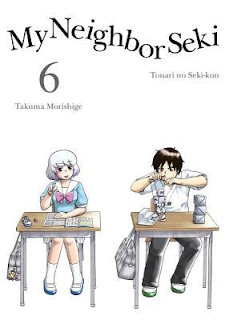 : Manga Monday: Has Yokoi completely lost her ability to focus? In 71st Period, it finally happens: Seki-kun is absent. Yokoi has grand plans of actually being able to study during history class, but of course today is the day that she leaves her schoolbook at home. Thankfully, Seki's is in his desk, because of course why would he have brought it home to study from? But it turns out that Seki can distract poor Yokoi, even when he isn't sitting next to her. In 73rd Period, Seki practices his surgical skills on some plush mascots. The adorable Billy Bear and Mitty-chan get prompt expert care, but only at the expense of poor Miss Cow. As Seki turns into an evil Black Jack, will Yokoi be able to protect the less fortunate patients? 79th Period brings a new twist to the schoolday. Seki's sister Jun has had her kindergarten classes cancelled, and she is too shy to stay with the babysitter. She wants to stay with her big brother Seki, and the teacher gives her permission to sit in class with him. When Seki doesn't include her in his games for the day, will she show the same craftiness as her brother and mom? Morishige shows that his creativity knows no bounds as he comes up with ever more outlandish projects for Seki that somehow always stay grounded in reality. At this rate, we'll have stories from these characters well into grad school. Highs: Any time a chapter ties into a previous one, whether by a reappearance of the Robot Family, Seki's sister, or the perpetually confused Goto, it adds a bit of much-needed continuity to a very disjointed series. Lows: The table manners he used were strangely antiquated. Verdict: I still don't know how the author manages to pull it off, but the series is still just as amusing and fresh as the first volume.